This is a very uncommon large 40.5mm. 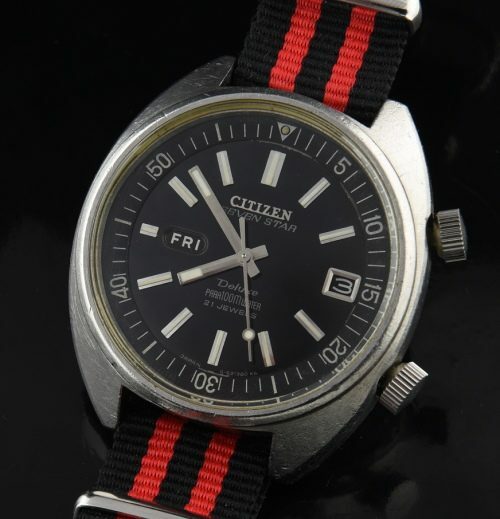 1969 Citizen Parawater 7 Star Deluxe 100 meter dive watch with inner turning bezel. The case remains unpolished and retains the scratch-less sapphire crystal. The black dial is very striking -glossy black with silver gilt print. The fine 21 jewel rotor automatic movement was just cleaned and is accurately keeping time. This watch has a day/date feature. This is the first time I’ve found one of these-a very cool looking watch on the wrist!